A large area of showers and thundershowers cover the western Gulf. Forecast models have been persistent in developing a low east of the Texas coast then rapidly move the low northward toward the upper Texas coast or western Louisiana coast by Saturday afternoon. It appears that the several hours before landfall will be the window of opportunity for development - late Friday Night into early Saturday afternoon. There is a chance that this system could develop into a tropical depression / tropical storm before moving on land. Regardless if it does or not, locally heavy rainfall of several inches may occur. Rainfall will likely be the greatest impact with the potential of flash flooding. Scattered showers and storms continue across the Texas and Louisiana coast and offshore. Doppler rainfall estimates are in the range of 2-5" to the south of Corpus Christi. 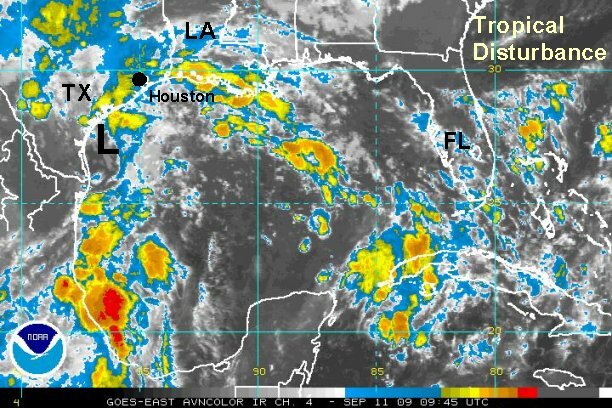 The low remains disorganized off of the Texas coast. It appears that the several hours before landfall will be the window of opportunity for development - late Friday Night into early Saturday afternoon. There is a slight chance that this system could develop into a tropical depression / tropical storm before moving on land. Regardless if it does or not, locally heavy rainfall of several inches may occur. Rainfall will likely be the greatest impact with the potential of flash flooding. Friday afternoon's forecast models keep the low pressure system in the western Gulf very broad. At this time it appears that it will move into the upper Texas coast without any significant strengthening. There is still potential for several inches of rain and flash flooding where rainbands stall over a location. We will continue to follow the progress of this low pressure system and post a full update if necessary. 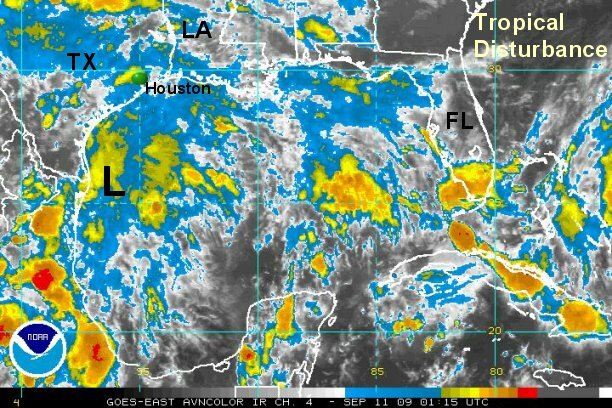 A large plume of moisture is associated with a broad low pressure area in the western Gulf. There still is no trend for organization of the low this morning. Despite this fact, heavy rain of several inches is possible where this band move inland...the upper Texas coast and western Louisiana coast. So far doppler has estimated 2-5" near and south of Corpus Christi and about 10" well offshore east of Brownsviille under the rain band. We will watch this area closely today and update as necessary. Additional heavy rain is falling in the eastern Gulf on the Florida coast. 1/2" - locally 4" of rain has fallen.